I’m so excited to share this blog with you today because it’s the love child of two of my favorite things… Costa Rica and sunsets. When I stumbled across Kristen’s Instagram, it was like sunset heaven, and I am slightly jealous of her ability to watch these masterpieces on a daily basis. I wanted her to share her knowledge and expertise with you guys, so that the next time your travel plans bring you to this paradise, you know exactly where to go to experience the best daily send offs this country has to offer! Hola y’all! Me llamo Kristen – that’s Español for ‘my name is Kristen.’ 😉 I’m a photographer dual based in Tamarindo, Costa Rica and Savannah, Georgia. A little over four years ago I quit my corporate bank job, hopped on a plane to Costa Rica, and never looked back. Soon after landing in Pura Vida-dise I started witnessing some of the most magical sunsets I’d ever seen. As a gal that never leaves home without her camera, my love for chasing and photographing sunsets began. Rule #1: Never miss a sunset in Costa Rica! Second, a little background on the sunsets in Guanacaste, Costa Rica: during the rainy season (May-November), the sunsets tend to be more dramatic due to the clouds in the sky, in comparison to the dry season not-a-cloud-in-the-sky sunsets. Both are equally as beautiful, but as a photographer the insane colors from the sunset clouds are a dream to photograph. 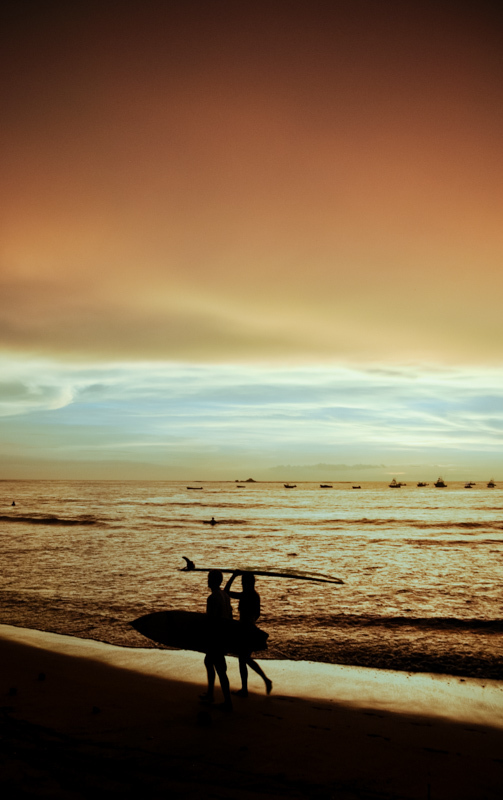 OK, now on to the good stuff - - the most romantic spots to watch sunset in Guanacaste, Costa Rica! You can never go wrong with a sunset in Tamarindo. One of my favorite spots - - and most romantic - - to watch Tamarindo’s famous sunsets is the lookout on the very top of the hill in Tamarindo. With gorgeous views of the Pacific Ocean, from the lookout you can see all of Playa Tamarindo, Playa Grande, Playa Langosta, and Playa Avellanas. To top that off, there is a breathtaking view of the mountains. The view is that good! It’s a perfect romantic spot to watch the sun pass over the Pacific Ocean - or to propose!! A local favorite beach here in Guanacaste is Playa Avellanas. Avellanas is a long sandy, crescent shaped beach. In contrast to Tamarindo, there practically is no development located beachfront. Waves break up and down Avellanas (a great beach for surfing!) and an awesome beach front restaurant Lola’s that offers delicious food. There also is a beautiful (romantic!) mangrove pathway to the beach accessible from Cabinas las Olas. Down a narrow, dirt road only a couple of miles outside of the buzzing surf town of Tamarindo, Costa Rica lies a secluded white sand beach called Playa Ventanas. Standing on this hidden beach in Guanacaste, you can see the buildings of Tamarindo, but you feel like you are in a different world. It’s oh-so-quiet, with only an occasional beach comber walking by from adjoining Playa Grande. It’s a perfect beach to spend an afternoon with the love of your life and document those sweet, simple moments. Moments like splashing in the ocean, walking down the beach, or watching the beautiful sun pass over the horizon as you hug your bae. If you are staying in the Playas del Coco area in Guanacaste, a great beach to watch sunset from the beach is Playa Hermosa (“beautiful beach” in Spanish). If low tide is in the afternoon during sunset, you can explore the low tide rocks on the Northern end of the beach and find a romantic spot all to yourselves as you two watch the sun pass over the horizon. Joining Playa Langosta and Tamarindo is San Francisco Point. Whether you are staying in Playa Langosta or Tamarindo, the beach walk to the point from either location is a perfect, romantic pre-sunset stroll. You and your bae can either snuggle up and watch sunset from the ledge or, if the tide is out, venture out on the low tide rocks as the waves crash around you. Just around the bend from Playa Guiones (also known as Nosara) lies a gorgeous beach front restaurant called La Luna. It’s a perfect spot to grab a sunset cocktail before you head down to the beach to watch Mother Nature’s magic. At low tide there are some really cool low tide rocks to explore, including a small blow hole as the waves roll in. Once the sun sets, you can head back to La Luna and enjoy a delicious meal (reservations are highly recommended). If you’re travelling to the region of Guanacaste, Costa Rica, these spots must be part of your itinerary. If you are thinking of a trip to Costa Rica, be sure to contact Brianna to plan your Costa Rican adventure. Kristen is a photographer for life lovers - - those who have a passion for life and an appetite for adventure. She is fortunate to split time between the surf town of Tamarindo, Costa Rica and the Oak lined squares of Savannah, Georgia. 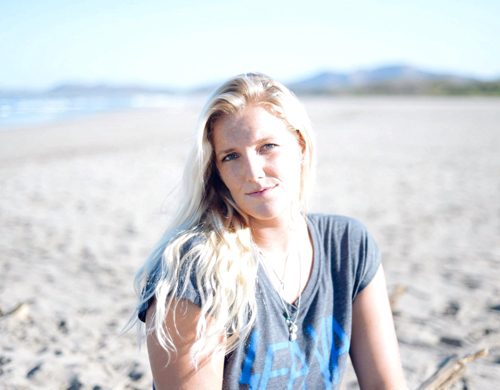 Most days you can her surfing beautiful Costa Rican waves, photographing a breathtaking sunset, working with her adventurous clients, or playing on the beach with her Chihuahua, Gidget. You can check out her work via her website, Samba to the Sea Photography and on Instagram @sambatothesea (she posts breathtaking sunset images daily!). AND If you love sunsets as much as she does, she just launched her online store The Sunset Shop (offering fine art prints, accent pillows, and postcards) - - now you can bring home your very own piece of sunset magic!